If you skipped the video, it is basically interviews with the actors who said "I have no idea what was going on, it was weird", audience members who said "we had no idea what was going on, it was weird" and the writer/creator, who said "I had no idea what was going on, it was weird". Fact is, the show was weird. And no-one knew what was going on. 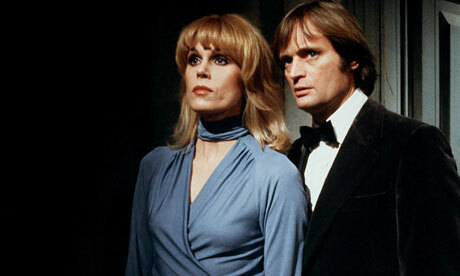 Sapphire and Steel were two figures who, from the title sequence, seemed to literally be 'Sapphire' and 'Steel'. Or not. They were elements sent by some higher power. Or they were angels. Or ghosts. Or aliens. Pretty much all of these are hinted at, and it's never explained. They turn up to battle strange occurrences which are often metaphysical. Sometimes the villain is the dark reality behind nursery rhymes. Sometimes it is the concept of photography. Sometimes it is the spirits of animals killed in an abattoir. Yes, it is weird and there's pretty much no point where anything is explained. Sapphire and Steel turn up at a strange occurrence and battle whatever cryptic forces are unleashed. Their main enemy is the concept of 'Time' itself which is somehow a malevolent entity constantly trying to break into the world. If that doesn't make sense, don't worry, it is never explained. So could Sapphire and Steel be Gems? Yes, they could. Like the Gems, they are not human, but take human form. They have strange abilities, and it is very possible they come from the Gem Homeworld to do battle with Time on Earth. Yes, 'Steel' isn't the name of a gemstone, but we've never met male Gems in Steven Universe. 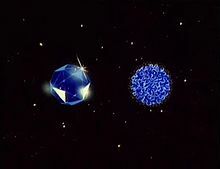 All the male elements in Sapphire and Steel are named after metals (Steel, Lead and Gold) whereas the females are gemstones (Sapphire, Ruby and Jet). Sapphire in particular shares many similarities with Sapphire from Steven Universe. Aside from both characters sharing the same name, they both dress in blue, and both have powers which involve seeing through time. Both are also graceful, empathic characters. All the 'element' characters in Sapphire and Steel have their own unique powers as in Steven Universe. While he doesn't have any sort of magic glowing weapon (probably due to 70s British television budget) Steel has the ability to freeze things around him. Not just making things cold, but allowing him to travel into objects and... look, it's weird okay. Sapphire and Steels takes place in our world in the 70s/80s, whereas Steven Universe clearly takes place on a world that has had Gem interference for thousands of years, wiping out great areas of America. So how can they be the same show? Remember, the enemy in Sapphire and Steel is Time itself, trying to break down the barriers of reality. There are two main schools of thought in Sapphire and Steel - the emotional (Sapphire) who wants to save everyone, and the pragmatic (Steel) who doesn't care how many humans he kills as the ends justify the means. (Before the show begins, their previous mission was hinted to end with Steel sinking the Titanic to stop whatever event was spiralling out of control, something that upset Sapphire). Perhaps it was decided that the situation on Earth was unsalvageable, and more pragmatic figures such as Steel won out over Sapphire. Maybe in a battle with Time itself they decided to start again and this time take a much stronger overt position on Earth starting from thousands of years in the past rather than covert operations in an attempt to strongarm the human race and sort out Time for good. Perhaps characters like Sapphire and Ruby turned against their fellows due to this drastic change in policy. Perhaps David McCallum will play Yellow Diamond. I agree, though there are some flaws with your theory. It's pretty much stated that the Gems are not female, but asexual, and only their personality manifest is "female". But yeah, I agree with this.